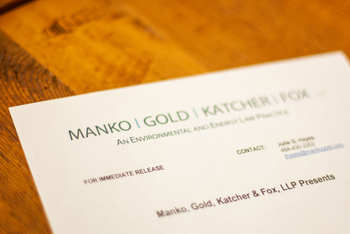 Philadelphia, PA (October 19, 2015) – Kate Campbell, a partner with the environmental, energy and litigation firm of Manko, Gold, Katcher & Fox, LLP (“MGKF”) located just outside of Philadelphia, PA, will participate in a panel on “Environmental Enforcement Actions in Pennsylvania.” This is a three-city series kicking off on November 9 (Mechanicsburg, PA) and also running November 20 (Philadelphia) and November 23 (Pittsburgh). There will also be a live simulcast of the initial program on November 9. These programs are all sponsored by the Philadelphia Bar Institute and registration details can be found here. Three CLE credits are available, including one hour of ethics.